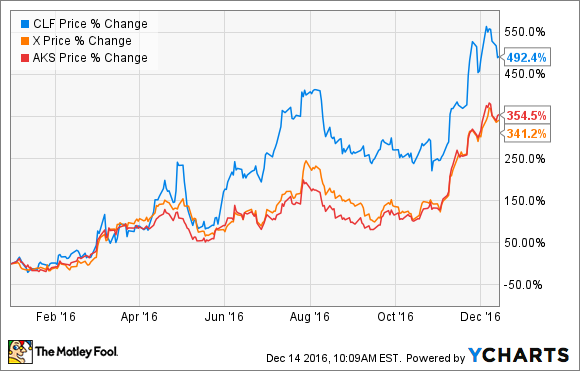 Investors in these three companies had an excellent 2016. 2016 has been a roller-coaster year for the stock market. After dropping by more than 10% over the first six weeks of the year, the S&P 500 rebounded nicely and is up by about 11% year to date as of this writing. While the market has done well lately, some stocks have shattered the overall market's performance. Here are three stocks that have more than doubled investors' money in 2016. Steel stocks have soared lately, and one particularly big winner has been iron ore producer Cliffs Natural Resources (NYSE:CLF), which has gained a staggering 492% since the beginning of 2016. Other iron and steel stocks, such as AK Steel and U.S. Steel have delivered terrific performance as well, but Cliffs has been the standout. Now, Cliffs performed well during the first 10 months or so of the year, having done a good job of reducing debt and benefiting from rising iron ore prices. However, the real gains came in the past six weeks, with a 61% rise in November alone. In a nutshell, Cliffs and the rest of the iron and steel industry have been big beneficiaries of the Donald Trump rally. The president-elect has specifically said that he wants to increase our steel production capacity, and his infrastructure plan calls for $1 trillion in spending over a decade to repair or replace our roads and bridges. Additionally, Trump has promised to protect American companies from unfair competition. For the iron and steel business, imported steel from China has flooded the market, and has been a major reason for plunging commodities prices (and the prices of iron and steel stocks). Trump has promised to fix this with tariffs on imported products, to ensure a fairer marketplace for U.S. companies. Telecom provider Sprint (NYSE:S) has gained 131% so far in 2016 after a dismal performance over the past several years. While the recent gains are a welcome rebound for long-term Sprint shareholders, the stock is still down 57% over the past decade. Sprint hasn't grown its postpaid or prepaid subscribers much in the past few years, with the only real source of growth coming from lower-profit unbranded wholesale subscribers. Additionally, Sprint has a high level of debt, and hasn't generated an annual profit since 2006. So why the strong performance in 2016? Well, the rally started in June with majority owner Softbank eager to invest more in the business, and really heated up in July with stronger-than-expected guidance. More recently, rumors of a buyout have helped send the stock's price even higher, and with Trump's anti-regulation policies, the market views a potential buyout as a stronger possibility now. 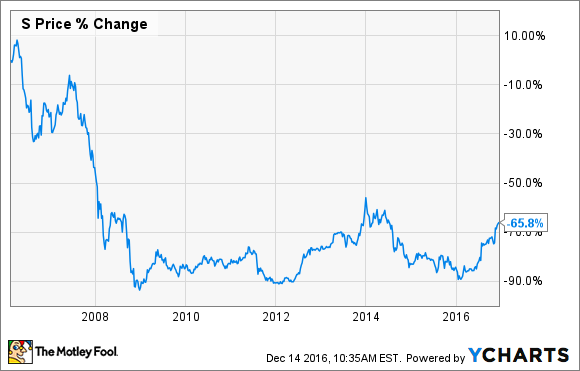 Freeport-McMoran (NYSE:FCX) is the world's leading copper miner, and also has operations in oil and gas as well as gold. The stock has more than doubled in 2016, up 116% year to date. The reasons for Freeport's rally are similar to those I discussed for Cliffs Natural Resources. Basically, Freeport's core businesses are expected to benefit from a Trump presidency. Trump's infrastructure plan to spend $1 trillion over a decade should also benefit copper miners, and Trump's pledge to make the U.S. more energy independent should be a positive catalyst for Freeport's oil and gas operations. Another contributing factor to Freeport's rally is the progress it's made on improving its balance sheet. The company does have high debt, but it has done a good job of chipping away at its debt obligations by selling certain oil and gas assets, including a recently announced completion of a $2.6 billion sale in November. These stocks have all performed wonderfully for investors in 2016, but that's no guarantee that the outperformance will continue into 2017. I'm a firm believer that Cliffs and Freeport will indeed benefit under a Trump administration, but the question is how much of this is already reflected in the higher stock prices. And in Sprint's case, it's rarely if ever a good idea to buy stocks on speculation of a takeover. Be sure to do your homework before considering any of these three stocks for your own portfolio.